Minisa Robinson worked as a graphic artist and publisher before becoming a self-taught pyrographic artist. Her artwork reflects her appreciation of the Rocky Mountains and the wildlife that lives there. 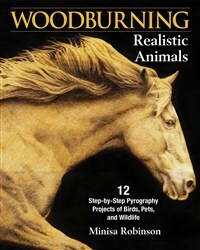 Minisa has created four instructional pyrography DVDs, and is a frequent contributor to Pyrography magazine. Learn more about her art at www.minisapyrography.com.